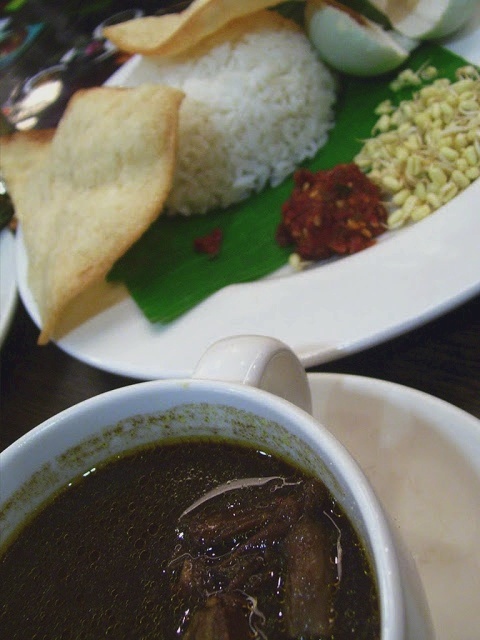 This authentic Nasi Rawon recipe is from Surabaya, Indonesia. It is served as a main course or soup in Indonesia together with salty egg, small beans sprout, shrimp crackers and sambal belacan. In Singapore, Nasi Rawon is sometimes sold during breakfast at Malay stalls. The best place to try this dish is at Geylang Serai hawker food centers or Haig Road. Clean the beef rump and cut into cubes. Blend shallot, garlic, ginger, candlenut, turmeric, red chili and black nuts (kluwek) until smooth. Heat pan and put all blended ingredients and saute until cooked and smell good. Add beef rump cubes and water to make the stock. Put kaffir lime leafs, salam, galangal, lemon grass and boil until beef is tender. Season with coriander powder, cumin, salt and sugar according to taste.